I’m not sure why I am so interested in augmented reality. I guess it seems more practical and immanent that virtual reality. Maybe I was really, really scared by The Matrix and I don’t want to be enslaved by the machines. Maybe it has been a slow week in EdTech news. After all – is FaceBook buying FriendFeed all that big of a shock? But the thought of a way to have your portable computing device actually interact not only with the World Wide Web, but also the actual world around you just seems so.. incredible. But how close are we to making augmented reality a true reality in our lives? Vuzix is working on a product that might just do that: the Wrap 920AV. The 920AV is a pair of sunglasses that have a see-thru screen that allows you to watch a display from your iPhone and still see the world around you through the same display. It even mentions on the page that the glasses are designed for augmented reality. Click on the accessories tab for some other cool options, like a motion sensor that tracks your head movements, and cameras that attach to the top of the glasses. This is the kind of thing I was thinking of when I first blogged on iPhones and augmented reality. Just think: with these glasses you don’t have to have to hold the iPhone like in the video from that post – the metro map is just displayed on your glasses in front of you. What if you mix this with Sixth Sense technology? What if you just saw your iPhone display floating in front of you, and moved your hands to interact with the apps (kind of like a portable version of the computers in Minority Report)? Talk about true mobile learning. You know those audio tours you can rent at tour spots like Alcatrazz – the ones that talk you through the attractions? Those can now make the jump from audio to visual – adding historical re-enactments, or showing you what lies behind the walls that they don’t want to tear down. I’m sure this kind of thing will be expensive at first, and I really hope they don’t hype just watching movies on these things. What I hope is that Apple catches a vision for this and makes it look really cool so that everyone will want it. To me, the news of Google pulling the plug on Lively came way too soon. Sure, Lively didn’t set the virtual world on fire, but there were some great ideas in there. It seems like it was also starting to catch on with Educators. And now they are pulling the plug? How many other dead Google products are still in development? We are ninth grade students at Westwood Schools in Camilla and started this blog to speak out about the fact that Google Lively is shutting down. Yep – not a bunch of geeky old people like us EduGeek moaning the death of some obscure tool that we never actually use – 9th grade students. But that is not all – they also blog about “Encouraging Corporate Digital Citizenship, Sharing How We Think Virtual Worlds Can be Used in Schools, and Creation of a Digital World to Teach Digital Citizenship to Students.” Wow. Even if you can’t make their protest (or don’t care about Lively that much – even though you should), at least check out their blog and read their thoughts on several virtual worlds – fascinating stuff. There was obviously some serious brain power and time behind this – but what a great educational opportunity for many different disciplines – not only history, but literature, art, cultural, and even religious studies. Hopefully, this will catch on and we will see more re-creations like this – maybe even ones tied to virtual worlds like Second Life? One can dream. Will the 3-D Web Ever Be a Reality? The 3-D Web has been kicking around the web world for several years. Some companies have even tried to start some kind of 3-D Web environment, mostly with unsuccessful results (like the 3B web browser). Most of these efforts have been to create a 3-D browser that just connects 2-D websites along virtual streets. Pretty ho-hum, especially in education. Who wants to float to a web site in a virtual world when you can just type in the address? Students would stay off-task forever. 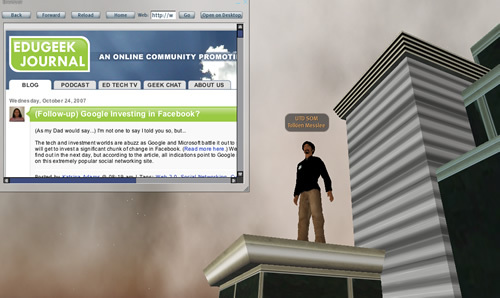 The popularity of Second Life and other online virtual worlds has made some speculate that we may be close to having a 3-D web. However, there are two problems with this. First of all, each online virtual world is separate from all others. You don’t have this on the Internet. Second, virtual worlds are not that great for transmitting information (just communication), and that is what makes the Internet so much more popular than any virtual world. Apparently, these two problems are getting close to being solved. First off – Second Life, IBM, and others are working on a standard that will open virtual world borders by creating a way for one account to cross into any online virtual world. If this catches on, that’s one barrier down. The benefits for education would be immense, as far as communication across distance and collaboration, but the higher technical needs to make any virtual world work on a computer would be a hindrance. But we’ll see where this goes…. 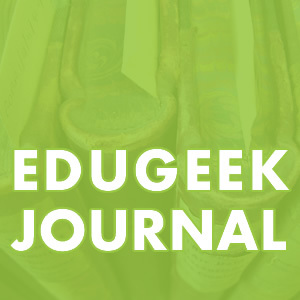 Like the other Edugeek members, I recently joined the Classroom 2.0 social networking site. I’ve only been a member for about a week, and I’ve already connected with others interested in classroom 2.0 technology and applications. I’m learning very cool things from other members and their projects. One of those projects is called Edusim, an educational simulation developed in the open-source 3-D platform, Croquet. The developers went beyond just creating an educational space within the virtual environment; they hooked it up to an interactive Smart Board. The following video from the Edusim website shows young students engaged in learning activities while interacting with the simulation. According to the Edusim creators, the Smart Board could be used with any virtual world, including Second Life. It wouldn’t have to be for children, either: chemistry students could conduct experiments in a virtual lab, for example. Such a simulation could be done in Second Life without the Smart Board, of course — but I imagine that reaching out with your hand to manipulate the environment is a different experience than simply pointing and clicking with a mouse. The children in the video certainly seem engaged. The integration of virtual worlds must enhance the student’s learning experience. It must “leverage existing teaching and learning strategies and best practices”. It must “integrate virtual worlds and Blackboard Enterprise Software through Blackboard Building Blocks and Blackboard PowerLinks”. The Blackboard community must be able to access the results. Read Campus Technology article here. Visit Blackboard’s Greenhouse Program site here. Got an interesting letter from the Lindens this morning. Hmm… is this the first step in a move toward a unified Teen+Adult Grid? Let’s hope so. As you may have heard, we’re implementing the first stage of an Identity Verification system beginning with age. Our ultimate goal is to give Second Life Residents the opportunity to reveal as much or as little real life information about themselves as they like, and to have that information verified. We see this tool as critical to supporting Residents in shedding anonymity and building trust-based relationships — but only to the extent that they’re comfortable. We’ve engaged the services of a third party provider, Aristotle’s Integrity, who will match information that Residents provide with information available in public records. You will be asked to provide your name, geographic location, birthdate, and an ID that is specific to your country, for example the last four digits of your social security number if you’re American. We will not be storing any information except for a code that tells us there was a positive match. Integrity will not keep any identifying information about you. Age verification will initially be used as a way to limit access to restricted content within Second Life. Therefore, in order to enter any parcel or region which has been flagged as containing restricted content, i.e. sexual activity or extreme violence, age verification will be required to ensure only adults, or people over the age of 18, gain access. Verifying age will be voluntary, except in this context. Prior to launching age verification throughout Second Life, we’re hoping you, the concierge customers, will help us out by trying the process and letting us know about your experience — if you were able to accurately verify your age, if the process itself is clear and understandable, and what problems you encountered. Please visit the Age Verification link available from the Your Account section of our website in the right sidebar and enter the requested information. This link is currently only available to concierge customers. When you are finished, you will be asked to take a short survey to fill us in on your experience. For more information on Age Verification in Second Life, please visit the Second Life Blog. Thank you very much for your help, and your continued support. (Many thanks to Erin, our newest EduGeek, for sending this to me!) MIT’s Technology Review posted this week a really interesting article discussing the inevitable merge of social virtual worlds (i.e. Second Life, There) with mirror worlds (i.e. Google Earth, Microsoft’s Virtual Earth). I must admit after reading the article that I’m neglecting to pay any attention to mirror worlds, and specifically Google Earth. I was incredibly interested in hearing about what’s already being done with these types of quasi-3D-mapping resources. The ability to create and view user-generated content added as layers on top of these virtual maps is ripe with educational opportunities. Great article! 3pointD.com recently got a sneak preview of Princeton University’s island in SL, which is currently closed to visitors. The blog includes extensive information on buildings and architecture featured on the island. Princeton obviously dedicated plenty of resources to create an impressive virtual presence. The sim will open to the public for the next academic school year (we assume Fall 2007). Click here to view the entire 3pointD.com post. Will They Be The Metaverse Generation? UTD’s Emerging Media & Communication (EMAC) blog posted this graphic recently. It’s attributed to the NY Times; however, I’m having a hard time tracking down the complete article. It’s pretty amazing seeing just how quickly these virtual worlds (or “virtual playgrounds”, as they’re listed in the graphic) are becoming widely used. We have the Gen-Xers. We have the Millenials. Will the next group be the Metaverse Generation?